Jerusalem, February 22, 2011 - Member of Knesset and World Likud Chairman Danny Danon told an audience of Likud Anglos that the Likud does not support the creation of a Palestinian state. 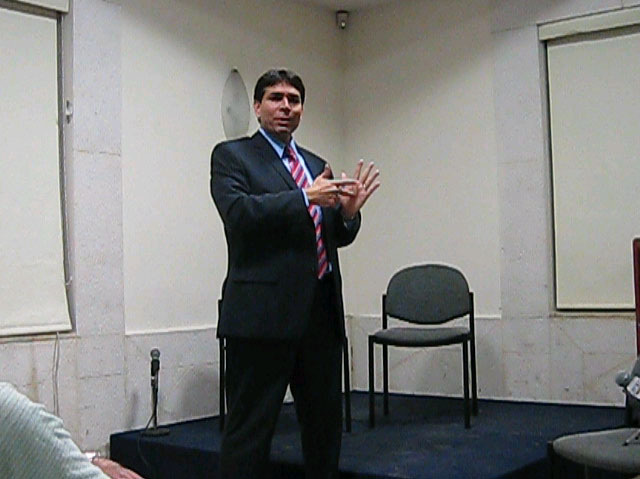 Likud Anglos hosted MK Danon, who is also the deputy speak of the Knesset and the chairman of the Knesset Committee on Aliyah, Immigration and Diaspora Affairs, on Tuesday at the OU Israel Center in Jerusalem, drawing a crowd of over 130 people. Click here for the Jerusalem Post news brief of the event. In support of his statement, Danon cited discussions with Likud members all over the country and a resolution of the Likud Central Committee from 2002, which Benjamin Netanyahu himself had initiated. Danon also mentioned a resolution of the Central Committee during the 10-month settlement freeze in which the Committee voted to support settlement construction and declared that at the end of the freeze building should continue. At the event, Danon discussed a wide range of issues, including passage of Iranian ships through the Suez Canal, which Danon characterized as a message from Iran, aliyah issues and the need for greater political participation among the Anglo community. One participant, a Nina Friedman, asked Danon about the prospect of electoral reform, suggesting the establishment of district elections for the Knesset. Danon responded that the best way to initiate such a reform was to do so gradually, making a certain percentage of Knesset seats elected through district elections.